Dinosaur eggs found together in China in what was likely a nest. Eggs like this have been found in clutches all around the world. This is a follow-up to my previous post on the 15 juvenile dinosaur fossils found in a nest. In that post I mentioned one of the explanations by flood geologists (ie. young earth creationists) for the presence of fossilized dinosaur eggs in the fossil record is that dinosaurs somehow escaped the initial stages of a global flood. Having done so they found themselves either moving from one piece of land to another or treading water for weeks at a time until some land became available for habitation. I want to explore this global flood explanation for dinosaur eggs a bit further. 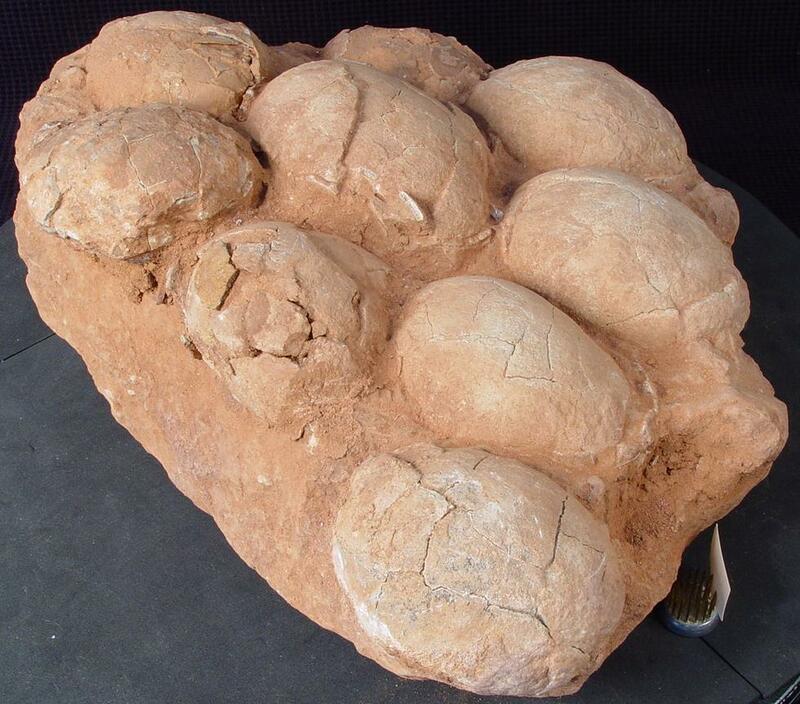 To do so I will review what I believe to be the most detailed analysis of dinosaur eggs from young earth perspective. That can be found in the article “Dinosaur Nests Revisited” by Walter R. Barnhart in CRSQ (Creation Research Society Quarterly) Vol 41 No 2 from September 2004. In this article Barnhart admits that dinosaur eggs are found in abundance in many locations around the world. What he doesn’t tell his audience is that all of these eggs are found only in a few layers of rock identified as Jurassic to Cretaceous in age and thus are not found in the lower portion of the fossil record nor are they ever found in rocks of recent origin. The main thesis of Barnharts’ article is to show that although there are many dinosaur eggs, those eggs show evidence of having been laid down in shallow water, in a hurry, and subject to inundation soon after resulting in many broken eggs. He attempts to show that the nests and eggs are not found in what would be expected to be normal living conditions. Therefore the dinosaurs that laid the eggs must have been in a hurry; like when they are attempting to escape a global flood. He doesn’t attempt to explain how they must have escaped the initial effects of the flood and came to lay their eggs on 20,000 feet of already deposited layers of rock. However he focuses on gravid female dinosaurs, presumably being very tired from treading water and running for weeks from the flood water, dropping their eggs whenever they could and in a hurry. Again, he doesn’t tell his audience that these eggs are found in multiple widely separated layers of rock. If he is right about a global flood and these running pregnant dinosaurs then to explain the positions of the fossils he must think that each of these layers actually formed separately with a time interval in between. During that calmer time when the sediments were exposed to the air and dinosaurs could have stopped treading water they must have walked around leaving tracks and building nests quickly! If so, then those nests were covered and more soil deposited by additional flood waters and more dinosaurs “landing” on the new soil layer and laying yet more eggs and leaving tracks. One has to wonder, given that these layers of rock represent layers of sediments from near the end of a global flood, if hundreds of thousands of dinosaurs could have survived the worst effects of the flood for so long, why must it be so that all them died in the flood? If the entire earth was not covered at any one moment why could not some animals have made it through the flood? Backing up a bit, what support does Barnhart provide, in addition to some evidence from the fossils themselves, that a global flood caused broken eggs? In the quote below we see that he attempts to find biblical support for the conditions of the flood claiming that the Flood would have caused distress for pregnant animals including dinosaurs and so the finding of dinosaur eggs is, in a way, more confirmation of what the Bible says about the condition of animals at the time of the flood. “The Hebrew term mabbul is used exclusively to refer to the Noahic Flood in Genesis, except for one use by King David in Psalm 29:10, “The Lord sitteth upon the flood.” This has caused some to consider that the actions described previously in that psalm are a result of not just any flood, but the Noahic Flood. In this regard, the phrase, “He maketh the hinds to calve” in verse 9 (KJV) has given translators some difficulty. (The New International Version translates it, “He twists the oaks.”) The word translated “calve” carries the idea of causing it to happen “out of season”. In the vernacular, that would be referring to a natural abortion. A natural abortion certainly can be induced by stress. While the psalm was referring to a mammal, the occurrence of dinosaur eggs laid into wet sediments might be an example among reptiles of what this verse was citing for the mammal. The gravid female dinosaur retained the eggs in the oviducts because of the lack of a safe location to lay them. Later, in an effort to save her own life in the Flood’s wave action, or as a response to the stress, she dropped them at the first contact with firm ground. Another possibility is that some dinosaurs may have been functionally or at least partially ovoviviparous, normally retaining the eggs in the oviducts until they were partially or completely developed. At the onset of the Flood, some dinosaurs already may have contained eggs which had been developing for considerable time. If this were so, it would account for embryos of varied ages and sizes all the way up to hatchlings occurring in egg shells and associated with regions where broken shells are found.. This brings me back to the main point of the prior post. The finding of juvenile dinosaurs fossilized in a nest makes Barnhart’s explanation for the presence of eggs in the fossil record even less probable (if that is possible!). To fit his theory, the eggs were not only laid by stressed dinosaurs but must have remained above water during the entire period of embryo development and hatching and then the baby dinosaurs were likely cared for, for some time, before succumbing to an apparent sand storm. The image of eggs that survive a long time, presumably during a chaotic global flood event, and yield living dinosaurs strikes directly at the heart of all of the explanations of young earth creationists for why eggs would even be found in flood sediments to begin with.